Less is more: Heroes - From an ACORN grows the tree. The news everywhere is beyond dreary. But let us focus on heroes instead, common people who expect no saviours but roll up their sleeves in commitment to help themselves and others steamrolled by the economic system. By spreading the news of these people with courage, we can inspire each other with hope. Together we are stronger. Last Thursday, I attended a rally in Watts, a small community in southern Los Angeles, sponsored by ACORN (Association of Community Organizations for Reform Now). 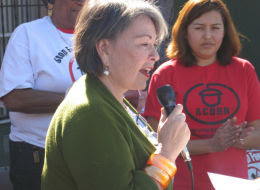 The rally was held to raise awareness about the critical nature of home foreclosures in Los Angeles and to launch ACORN's Home Defender Campaign. The campaign is designed to keep foreclosed families in their homes. ACORN implements various methods to accomplish their goal. On the one hand, you have ACORN representatives directly communicating with lenders and on the other hand you have civil disobedience - ACORN representatives and volunteers locking arms along the sidewalk to block eviction officials from entering homes slated for auction. Despite the negative characterization ACORN received last year during the general election, ACORN has been helping moderate and low income families for more than 30 years. ACORN has over 400,000 member families organized in more than 1,200 neighborhood chapters in 110 cities across the country. Participating at the rally was comic, writer, producer, actress, and, unbeknownst to me, political activist Roseanne Barr. Below is my interview with the ACORN supporter. Kathleen Wells: Roseanne, how did we get here? How are American citizens, all across this nation, facing unprecedented levels of home foreclosures? Who is at fault and why is this happening? Roseanne Barr: The people at the top are to blame for their rapacious and unregulated greed. Poor people rot in jail for doing far less damage than corporate criminals at the top who are coddled after committing more far-reaching offenses. KW: Tell us, how did you get involved with ACORN. What were some specific campaigns that you have been involved with and how do you see your role going forward? RB: I was introduced to ACORN while I was on the road with Michael Moore during the 2004 presidential campaign. We met with Acorn chapters in Florida, Iowa and a few other cities. My boyfriend Johnny, me and Michael Moore's whole crew helped to drive old people from the inner city to the polls in Cleveland, Ohio on a snowy, cold election day during the second election that was stolen by Bush and Cheney. 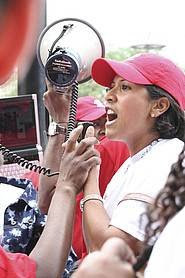 I instantly recognized the women in acorn as being the same kind of women I had been in collectives with in my younger years in Denver, Colorado. I have always been a labor activist, as was my father and his father. Even the Roseanne show was a sit-com about American Labor. KW:Elaborate on some of the things you've seen working with ACORN? RB:I have seen that ACORN is the lobby for people who have no lobbyists. I have seen them organize and work with people in the most economically challenged corners of this country, where people are on their last leg and pushed up against the proverbial wall. I like the people personally because they believe there can be justice and peace, and that those values are American and moral. I helped them to raise the minimum wage across the country. They are unstoppable, because God is on their side. I also like the way a lot of these women can bake a pie, discuss economics and transform the lives of everyone they come into contact with. Women my age are a force that is getting ready to unleash itself against evil. But, the most impressive thing is that they elected Barack H. Obama through their fantastic organizing skills and knowledge. KW: As you know the ACORN rally was held at the home of the Beard family. They have already been foreclosed upon, despite living in their home and raising their 3 children in that home, since 1985. For the past 10 years, Mrs. Beard worked as a teacher assistant and Mr. Beard has consistently worked as a cook, for 17 years. They refinanced to make repairs to their home - repairs that had been needed since before 1985. This was their first time refinancing. Their payments shot from 1,700 a month to over 3,200 a month. What does the Beard's story say to you, Roseanne? RB: That banks and other lenders, advertisers, real estate agents all played fast and loose and made their money up front or along the way, but at the end of the process it's the working people who are out in the cold. Now there's a trend toward blaming buyers for being irresponsible. But, those buyers were often assured that rising home prices and values would always keep them ahead of their debt load. We saw commercials all day long encouraging people to borrow against their home equity. Now the bubble equity has vanished into thin air but the crippling debt remains. KW: Will you go as far as to participate in ACORN's method of civil disobedience? You know, the part about locking arms with family members, when eviction officials arrive. You run the risk of being arrested - how, does that sit with you? RB: I told Bon Bon and the other ladies of my age there that if they would watch my back I would watch theirs. One old woman told me in translated Spanish that she had been arrested for political reasons in her seventies (she is in her eighties now) and that the hamburgers were good in jail, and that everyone treated her like a queen, and the jailers told her they thought it was wrong to imprison old weak women. I said I will go anywhere for a good free burger. I think women in jail would like a lot of my jokes. KW: I'm sure you've heard that California is suffering a budget crisis. I think our deficit is at 42 billion now. However, when the Governor came into office, 6 years ago, the deficit was 4 billion. What are your thoughts about that? RB: I do not like Arnold because he hangs out with people who steal homes from widows and orphans and then they auction it off for half its value and then turn around and sell it again for a profit on the first profit, and then complain about how unfair the widows and orphans are for wanting health care and schools and hospitals. They are sociopathic pirates like in the Disney movie. KW: Just last Thursday and ironically, the same day as the ACORN rally, the Governor, signed a package of bills, all aimed to balance the budget by the year 2010. Along with those bills, were two other bills that call on a 90 day moratorium on home foreclosures in the state. However, the Governor hasn't signed these 2 bills yet. Your thoughts? RB: Pick up the pen punk. This story was reported and written by Robert Temple. He is one of the HuffPost citizen journalists helping cover the on the ground effects of the foreclosure crisis. Sign up here to participate in HuffPost's new EyesandEars citizen journalism feature. As you drive south along South Park Avenue in southern Tucson, you pass streets named for U.S. states: Michigan, Ohio, Tennessee and Oklahoma. A symbolic reminder of the national scope of the housing crisis. Ana Castro lives on Kentucky Street, filled with modest homes and lined with Palm and Palo Verde trees. Located just six miles from the Davis Mountain Air Force Base, the peaceful setting is often temporarily interrupted as pairs of A-10 Thunderbolt (a.k.a. 'Warthog') fighter jets streak by on training missions. Ana's house isn't filled with expensive frills. A modest, well kept one story, two bedroom house of about 1000 square feet, there is no cable or high speed Internet connection. Ana doesn't own a computer, and the television brings in only local channels using a rabbit ear antenna. She has lived in this house for fifteen years, easily affording the $430 mortgage payment while making small home improvements like planting a lemon tree and installing landscaping bricks with the help of friends and neighbors. That began to change three years ago when she refinanced with Wells Fargo. What started out as an affordable $650 per month payment for the first two years started to increase. Her monthly payment is now $1450 at an interest rate of 17.5%. With Ana's job as a Prep cook at the Universal Medical Center bringing in $10.50 per hour, she is unable to keep up with her steadily increasing house payment. How did Ana find herself in this situation? Ana says that the bank lied to her about the terms of her loan. Before she signed the finance agreement she was insistent about the monthly payments. She wanted to make sure she could afford them. The bank assured her she qualified. Two years later when Ana noticed her payments rising, she called Wells Fargo asking for an explanation. Each time she called she talked with someone different than the last time. What didn't change was their answer: she agreed to the terms of the loan at the time she signed the papers, and she had no choice but to make the payments. Soon Ana was unable to afford the monthly payments on her home of 15 years and the bank started foreclosure proceedings. Now when she calls them they tell her she has to make a payment of $4000 before they can even begin to do anything to help her. In addition, the foreclosure has damaged Ana's credit rating, making it impossible for her to obtain other financing options. With no where left to turn, Ana called the Tucson ACORN office. They have been a great source of support for Ana, providing financial advice and advocating in her behalf. 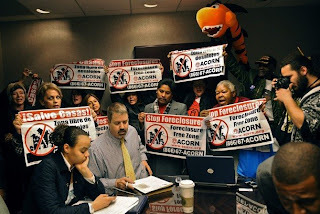 ACORN also has a support system of volunteers called "Home Defenders", which are a group of volunteers foreclosed families can call at any time for support. Through it all, Ana is hopeful and determined. Although feeling the stress of her uncertain future, she gives thanks to ACORN, as well as friends and neighbors and for their support and "Prays to God every single day" to let her keep her house. Today, ACORN is hosting a protest and press conference at Ana's house. Jorge Garza is organizing the event, and is joined by others whose homes are being foreclosed. Madeleine Troyon, Dolores Fair and Maria Jimenes are all members of, and being supported by, ACORN. They each have a unique story to tell. Madeleine was upbeat about the future, saying "I am so happy we have a president that is helping us." "
Dolores is hoping for broader support, telling the people gathered there "We need our community to stand with us." Jorge Garza, who works with victims of predatory lenders every day, sums it up this way: "Banks do not deserve 20 years of someone's life just because [the banks] were greedy." As for Ana, she expects to keep her home, and says "We will fight to the last" to do so. Legislative efforts are afoot in Washington, D.C., and in Indianapolis to protect homeowners and renters from foreclosure and eviction as the mortgage crisis gains momentum. But rather than wait for help, the community group ACORN is set to launch a local eviction rapid-response team to prevent people from being thrown out of their homes. The "Home Savers" will consist of people who can mobilize on short notice to defend homesteaders against attempts to evict them. Eric Weathersby, director of Northwest Indiana's chapter of the Association of Community Organizations for Reform Now, said the group will rely on telephone calls from homeowners starting next week to determine who needs help. As part of a national campaign, ACORN is encouraging people to refuse to move out of their homes or, in some cases, move back in. The civil disobedience campaign aims to pressure federal officials to come up with a solution to the housing crisis. President Barack Obama announced a plan this week to stem the tide of mortgage foreclosures by earmarking $75 billion to prevent 9 million homeowners from being evicted. He also announced a plan to double aid to mortgage companies Fannie Mae and Freddie Mac to $400 billion to encourage them to refinance home loans. On the state level, Sen. Karen Tallian, D-Portage, has written a bill to force mortgage lenders to the table to try to negotiate new terms with homeowners on the brink of foreclosure. Another bill in Indianapolis would give renters a 10-day notice of a pending foreclosure, and give them the power to void their leases if the building in which they live is about to be foreclosed on. But Weathersby said there is currently "a breach" his group needs to fill. "We are supportive of the president's plan, and that of Senator Tallian," Weathersby said. "In the meantime, however, we need to do what we can to keep people in their homes." The "Home Saver" teams might engage in civil disobedience, physically blocking sheriff's police from getting to the front door of a house to serve an eviction notice, Weathersby said. Lake County Sheriff Roy Dominguez has been at odds with ACORN for months on the eviction issue. Dominguez says he must carry out court-ordered evictions, and warned ACORN not to try to prevent his officers from doing so. Comment on this story at www.post-trib.com.